I heard something recently that spoke to me. It was about competition. I am pretty competitive. I want to be the best, the most available, the first one with my hand up, everybody’s friend. So what has that attitude done for me so far? It has exhausted me. I have spent my whole life being a people pleaser. I want everyone to like me. When I turned 40, I did change that attitude just a little bit and I became a little tiny bit less eager to be everyone’s best friend. Competition is good for one thing–it makes me try harder. It made me study so that I could pass the certification exams the first time; it made me finish walking a 5K even though I had done nothing to prepare; it makes me say yes to work projects that someone else could do just as well as I can because I want to always be the one who saves the day; and it keeps me up late at night finishing tasks that I have promised to get done in the many ancillary personal projects I have undertaken–all in my quest to be the best. I heard somewhere once that if you always say yes and you always are the first to volunteer, you’re cheating someone else out of the chance to do that job. Perhaps they’re scared, perhaps they’re waiting to see if you volunteer AGAIN, perhaps they are nervous that they can’t do as good a job as you’ve been doing. But honestly they probably can do it just as well as you can and maybe, just maybe, they can do it better than you can. They probably won’t do it the exact same way, but it will get done. I’m trying to do this now, but also don’t want to quit doing everything so people forget that I can do some of those things. I guess I’m afraid of everyone retiring me because I’m old even though I still feel like I have things to offer. But that’s not happening today, so I will work to make sure people know when I’m willing to take things on. So exactly who am I in competition with? And what was it I heard that started this post? It was “Look in the mirror. THAT is your only competition.” That was a zinger right in my heart. I am my only competition. And my only goal should be to be better tomorrow than I am today. To do that, I need to heed the advice I have often given others (and others have given me back)–step away from the buffet line. I think life is like a buffet. You have a plate and as you go through life, you take spoonfuls of things you’re interested in, things you do–work, volunteering, passion projects, family, church, and on and on. Sometimes, you’ve piled so many spoonfuls of these things on your plate that you spend all your time trying not to let important things slip off the plate. 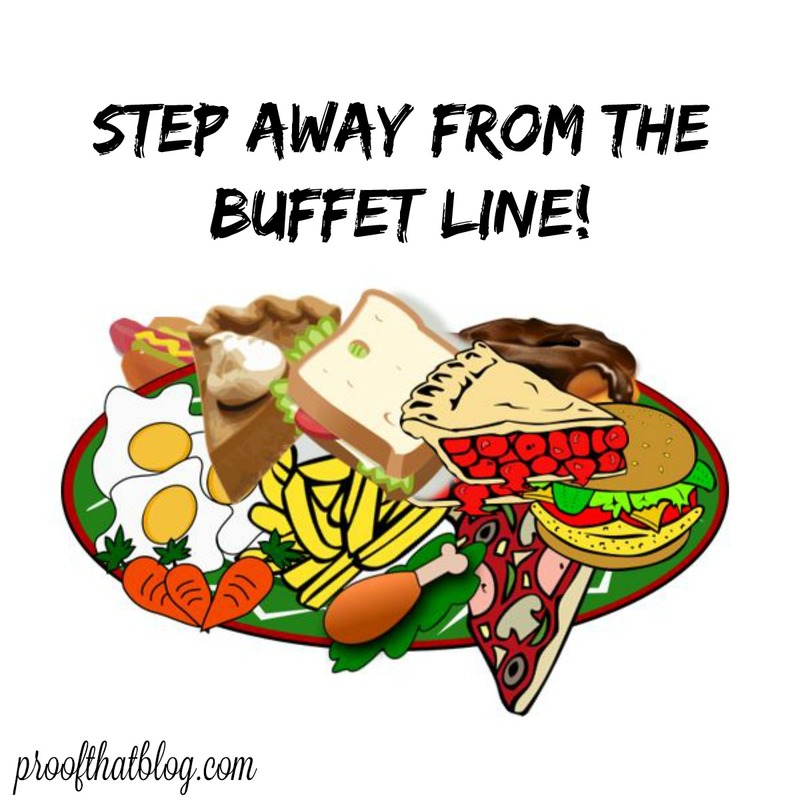 Sometimes, we just need to step away from that buffet to catch our breath, get rid of some of the stuff on our plate, and get ourselves in a place so we are ready to go back to the buffet line. They say life is a race and if we’re running the race while we’re juggling our buffet plate, things will spill, we will fall, and we will get up again–plate and all–to continue our race. But this race doesn’t have other runners. The only competition we have is ourselves. We are the only one carrying that plate everywhere we go. Are you carrying it as a badge of honor? Do you want everyone to see your messy, overfull, drippy mess of a plate and be envious of all the things you can do at one time? Are you doing all of them well? Are you doing ANY of them well? As I’ve gotten further into this post, I see that I’m using “you” when this is really “me.” I’ve been there and done that and am there and doing that, so I think this is a message from my heart to my head and maybe it will help someone else come to grips with that damn buffet line. I guess I need to look again at my competition in this race called life and give her a chance to take a breath and run with a plate under control. We’ll see how the next lap goes. This entry was posted in Competition on November 22, 2017 by Kathy. Someone, somewhere along your journey, probably reached back to help bring you up a ladder–whether personally, professionally, athletically, musically, whatever your interests and passions were–you probably didn’t do it all by yourself. The proverbial “line” is the measure you inch along as you get more experience and become a more valuable member of whatever “team” you’re involved in. There are lots of people all along your line. Some have much more experience than you do, and some are just starting out along your line. You may have had a mentor–whether you knew it or not–someone who was there to answer questions, give you instructions, help you find your way. Now that you’ve been doing it long enough that you’re mentoring others–whether you call it that or not–it is your turn to help someone else along that line. Personally, I feel that it is my duty to help others in my chosen profession. Although I refuse to admit it, I won’t be doing this profession forever and it’s important to me that others love it as much as I do. It’s not a job. It’s my career–one I chose, one I studied for, one I took multiple certification exams for, one that I love. There is no more fulfilling feeling than watching someone that I have mentored bloom in this profession, pass certification exams, and mentor others. Well that’s just on my profession line. I have a blogging line, a direct sales line, a grandmother line, a mother line, a wife line, basically a spiderweb of life lines. On some of them I’ve pretty far along, but on others, I’m just hugging the bottom–for now. 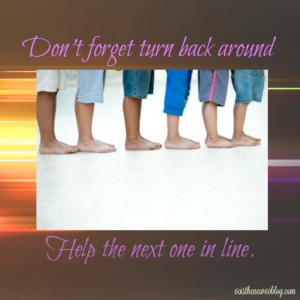 So check to see where you are on your many lines and how you can reach back and help someone to move up the line behind you. And then do that! This entry was posted in Mentoring on November 8, 2017 by Kathy. As I was sitting in the dentist’s chair recently getting a root canal (aren’t you jealous of all the early morning fun I’m having?) and he started working on drilling the tooth, my mouth wasn’t completely numb. The second jump made him stop, give me more numbing medicine, and give my mouth a few minutes to numb up. I was thinking how that is just like life. Sometimes the things we start to do don’t work the way we want them to. When that happens, we need to take a step back and regroup. Try a new way of doing things. Go a different route. Bring in different people. Too often people think their way is the only way to do something. That is never correct. This happens a lot in organizations and businesses. Just because something is done the way it’s always been done, that doesn’t mean it’s the only way to do it. Someone else may have a much different—and probably better—way to do it. They have traveled a very different path than you have, they have different life experiences than you do, they have learned differently than you have. Usually, as long as the thing gets done, does it REALLY matter HOW it is done? Or is it sufficient that it IS done? Let people experiment. Things don’t always need to be done the same way. And if their way doesn’t work? Step back and regroup. Then you can either do it your way (without the “I told you so”) or try a totally different way. Be open, be kind, and be productive. Those things will all happen if you are willing to let others do the job they have agreed to do without you hovering or micromanaging them. 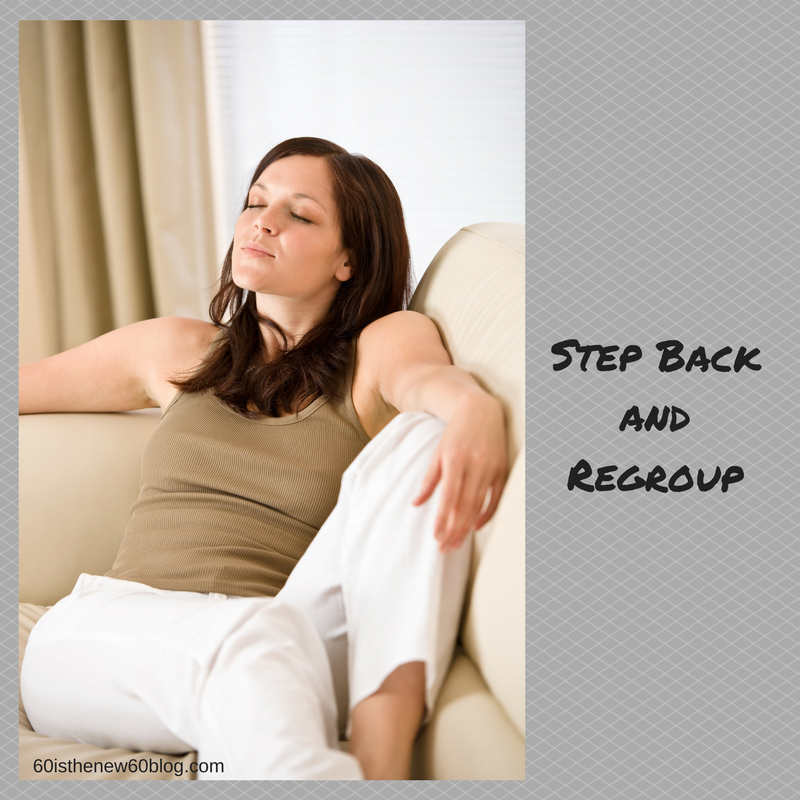 Just step back, take a breath, and regroup. This entry was posted in Volunteer on November 1, 2017 by Kathy.